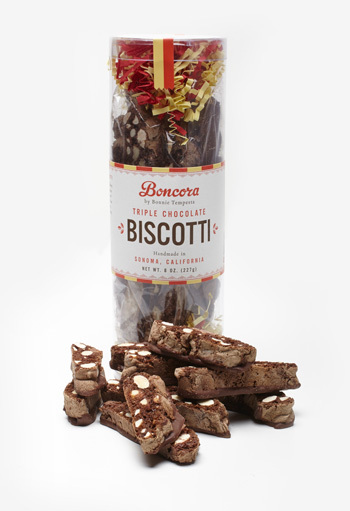 Boncora’s new Triple Chocolate biscotti are so named because they contain triple the amount of chocolate as Boncora’s Classic Almond biscotti. To get all of that delicious chocolate into one cookie, we first mix up a rich chocolate dough, then add chunks of Guittard chocolate, bake the cookies twice, and, finally, hand dip each biscotti into a luxurious blend of Guittard milk and semisweet chocolate. 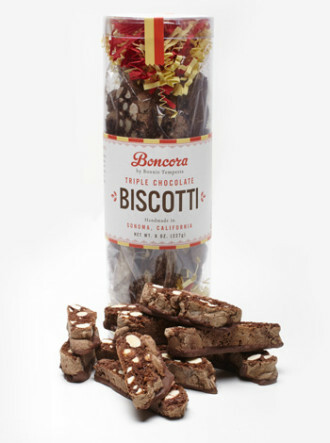 Light and crunchy and loaded with California almonds, Boncora Biscotti are baked and cut by hand, so the size of the cookies will vary. Each tube of biscotti contains approximately 10-12 cookies, carefully sealed in 2 cellophane bags and gently placed in a festive tube with red and yellow streamers. Due to the handling and shipping of these handmade treats, the minimum for online orders is $25. During the months of May - August, we're not able to use ground shipping for our chocolate products. If you do order chocolate products, we can ship USPS priority. We apologize for the inconvenience. Find Us At These Retailers!